In fabrication of metallic structures, fundamental dimensional changes that occur during welding are often found. This is what we call “Weld Distortion”. When fusion welding is performed, the melted metal irregularly contracts on cooling from the solidus to room temperature, resulting in shrinkage over the weld and exerting eccentric force on the weld cross section. The weldment elastically strains in response to the stresses caused by the contraction of the weld metal; hence you notice the irregular strain in macroscopic distortion. What are types of weld distortion? 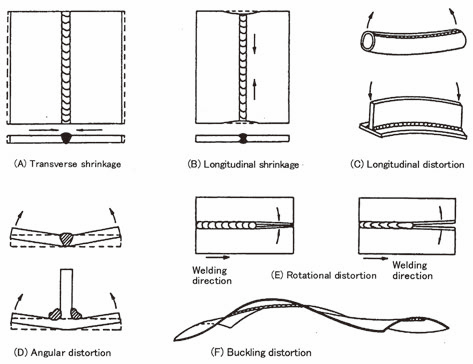 There a number of types of possible weld distortion as shown in Figure 1: (A) Transverse shrinkage, (B) Longitudinal shrinkage, (C) Longitudinal distortion, (D) Angular distortion, (E) Rotational distortion, and (F) Buckling distortion. Their dimensional magnitude of weld distortion and/or shrinkage depends on the king of metals being welded and the welding procedure. How can weld distortion be prevented and corrected? In fusion welding, the groove preparation, the sequence of deposition, the order, etc. minimize weld distortion. 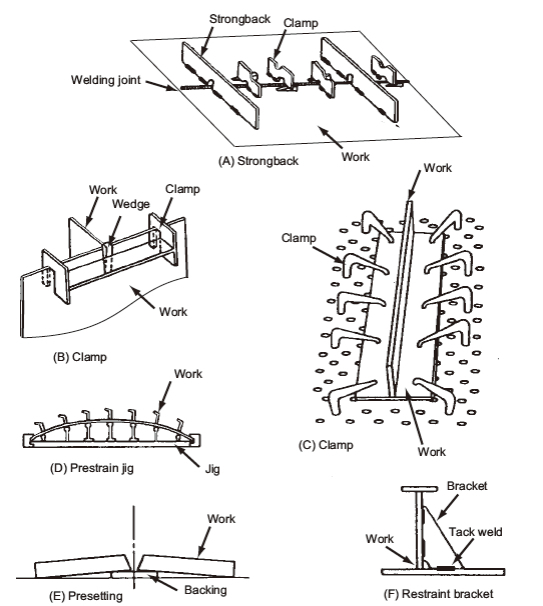 There are various methods to prevent weld distortion by using a clamp, wedge, etc. as illustrated in Figure 2. 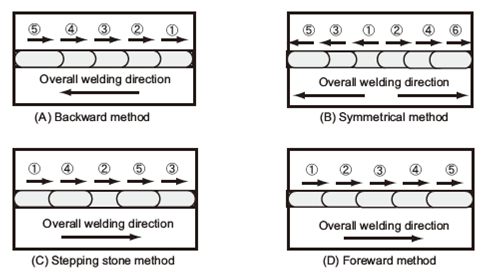 Several welding sequences such as forward, backward, symmetrical and stepping- stone methods are also very useful as shown in Figure 3. In general, a structure to be welded has a number of welding lines. Therefore, welding in the wrong order leads to weld distortion and weld cracking. Thorough examination of welding method, the order of welding and choice of appropriate welding parameters are in great need in advance, taking into account the contractions and expansions caused by welding. Distortion can be removed by producing adequate plastic deformation in the distorted member or section by thermal or mechanical methods; thermal or flame and/or mechanical straightening with a press or jacks. Preheating and postweld thermal treatments are also very effective. Yamamoto Shigeaki. The ABC’s of Arc Welding and Inspection. Shinko Welding Service Co., Ltd., Second Edition, 2003, P.58-59. Welding Handbook Vol.1, AWS, 8th Edition, 1987, P.241-264.